When it comes to the big day, it is important to be as ready and prepared as possible. However- with first-time pass rates being less than 50% it isn’t always possible to achieve a first-time pass in then UK. Here you shall find My Top Ten Tips If You Fail Your Driving Test! When it comes to passing your driving test, it is every learner driver’s ambition to pass it first time. However, the national pass rate sits at a measly average of 46% (2018), which fluctuates from test centre to test centre. It appears the more the remote the test centre, the higher pass rate, and the more condensed the area such as cities, the lower the pass rate. 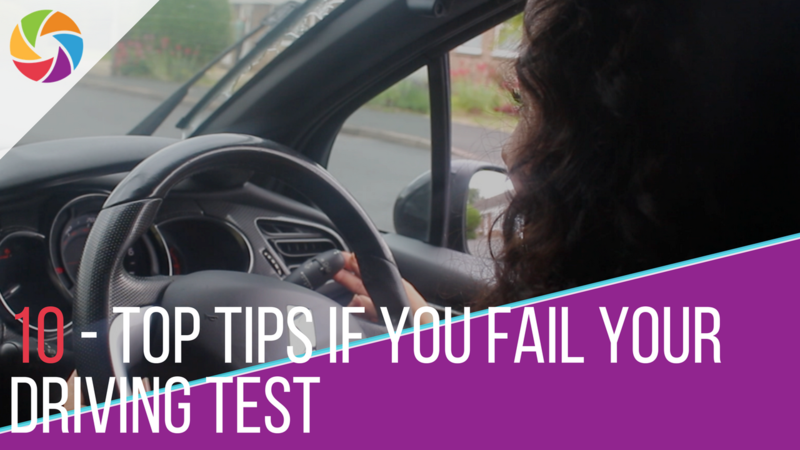 Whether you take your test in a city, or in a rural community, follow these Ten Top Tips If You Fail Your Driving Test. 3 3 – Read Our ‘101 Ways To Fail Your Driving Test’ Blog Post! 10 10 – Keep calm. It is really important to keep on the right track. Having a goal is a positive step to keep the motivation going. It is always a good idea to re-book your practical test ASAP. With driving test waiting times exceeding 12 weeks in many areas of the UK, it is vital to get yourself back on the wagon and get yourself a new driving test date! Once you have your new test date, you can plan your next steps to improve your chances of passing your driving test next time around! It is important to work with your trainer to establish a clear training plan moving forward. It is very important to keep your previous test report – so that an action plan of training can be put into place. Your trainer will be able to advise you on the topics and areas that you will need to have more training in and will use your test report as a guide for on-going training. A general rule of thumb for training is: For every driver fault you have (minor fault) you would need approximately 1/2 hour of training, and for every serious fault accumulated- this would require an hours worth of training. 3 – Read Our ‘101 Ways To Fail Your Driving Test’ Blog Post! There are lots of things that you can do at home to help increase your chances of passing your next driving test. You can read our-in-depth 101 Reasons To Fail A Driving Test here. Nobody said driving was easy, lots of people fail there the first attempt – or even their 6th attempt, but how many times did Katie Perry get knocked down before she hit the back time! And why does the UK rank second in the world, for having the safest roads in the world – cause we have a great system in place to protect us! You have only failed one of the hardest driving tests in the world – only just, crack the whip – you’ll get it next time! If you have access to a car, and your lovely mum or dad are willing to sit with you, go out for an hour, get out as much as you possibly can! You can’t build up road experience sitting on your bum eating pizza on the sofa! Get out there, absorb everything, debate with your parents if you have an opinion. Enjoy the learning process – driving is hard, and you’ll never be perfect, not now and mot in 10 years time! It is a good idea to get your head back into the books. Being able to put theory into practice requires practice and understanding. Without the pressures of a theory exam, learners can focus on inputting their theoretical knowledge into their driving practice. Reading the Highway code will refresh your knowledge and help you make better decisions when . next out on the road. But the reality is, passing the driving test is hard. It is one of the hardest driving tests in the world, and getting to a pass level is difficult. The reason why so many people fail their driving test – is actually, quite simple maths: they simply have NOT had enough time driving. Whether that is with a driving instructor or learning to drive with mum and dad. You really can’t put a price on experience, and all that extra experience will help you make better decisions when out on your next driving test. So, by chatting with your friends, you will be able to understand other people’s experiences more, get a better perspective, and ultimately feel better about your past performance and move forward with a new focus for the next driving test. Observing other people’s driving is actually a really good skill to enhance analytical skills. You can turn it into a game, and play the role of the driving test examiner. Imagine, your friend is on a driving test, and you are their examiner. You give them directions and tell them where to go and what to do. But, all you do is observe their driving – and make notes as your friend drives the route. At the end of the drive – or the test, you discuss with your friend what mistakes they made. Would they agree with you? Or would they disagree? You can then discuss why you believe what they did was wrong and have a healthy discussion on the topic. Not only will you really observe and analyse your friends driving, but you will also be able to reflect and share opinions. Make it fun, and I am sure you will become a better analyser AND become more open-minded to your own driving when you go out yourself. Watching videos on YouTube may help you. Sometimes a fresh perspective on a particular driving topic can help further your own understanding of a driving topic. There are millions of videos on YouTube about learning to drive, and especially passing a driving test. You can even find test routes on YouTube. Here are some examples as to how YouTube can help you! There is no point in panicking. Failing a test isn’t important, what is important is being a safe driver for life. If it takes you a few attempts to pass your test- it could save your life!